(CNN) -- Large crowds gathered in the Iranian capital Friday to march in an annual pro-Palestinian rally, among them thousands of green-clad supporters of the opposition movement, according to CNN sources in Tehran. The Quds (Jerusalem) Day rally, in support of the Palestinian people, is observed on the last Friday of the Muslim fasting month of Ramadan. This year, the rallies were particularly tense, following the unrest over Iran's disputed presidential elections in June. Opposition supporters chanted "death to the dictator," the witnesses said. Many held up the victory sign with their fingers painted green, the color adopted by opposition candidate Mir Hossein Moussavi. Opposition supporters chanted "death to the dictator," witnesses said. Others shouted "liar" as they listened to his anti-Israel speech. During the speech, Ahmadinejad repeated caustic statements about Israel and the Holocaust in a speech he delivered Friday to mark support for the Palestinian people. "The existence of the Zionist regime is an insult to human dignity," Ahmadinejad said. "They just try to support the myth of the Holocaust and at same time they hoist the flag of supporting the Jews." The Iranian leader also lashed out at Israel's supporters, including the United States. The crowd periodically chanted "death to Israel." Similar comments made by Ahmadinejad at a U.N. conference earlier this year sparked international outcry. Israeli Prime Minister Benjamin Netanyahu declared then that Israel would not allow "Holocaust deniers to carry out another Holocaust against Jews." Security forces blocked off the streets leading from Revolution Square to Tehran University. Witnesses reported heated moments, but they said the rallies had not escalated into the kind of violent clashes seen in the aftermath of the June 12 election. 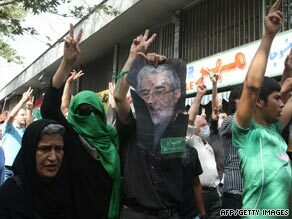 Ahmadinejad, the hardline incumbent, was declared the winner, but Moussavi's supporters said the vote had been rigged. The Iranian government restricts the activity of journalists in Iran, making it difficult for news organizations to independently obtain or confirm information. CNN's Reza Sayah in Islamabad, Pakistan, contributed to this report.